Just another day in paradise here in the Tri-State. While high temperatures topped out between 3° and 5° below average for this time of the year, this morning’s cloud cover cleared up almost on cue and gave way to an absolutely beautiful afternoon. Unfortunately, these nice conditions do little to soften the realization that we’re drawing ever closer to our impending cool down and possible winter weather! 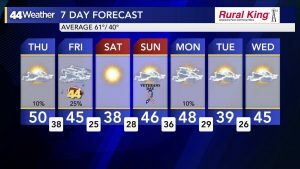 A one-two punch of low pressure systems on Thursday and Friday will not only drive temperatures across the Tri-State to their lowest point in nearly eight months, but may even supply the region with our first flurries of the season! Our first core of low pressure will trek northeastward from the Mississippi Valley, passing across Tennessee and Kentucky introducing Gulf moisture back into our area; we’ll receive scattered rainfall as early as late Thursday night from this first system. 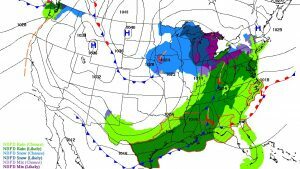 The second low will swing across the Great Lakes en route from the Dakotas and spread its associated cold front across the entirety of the Midwest. The cold, arctic air flowing in behind the passing front will quickly change whatever lingering precipitation we have Friday into an isolated wintry mixture or light flurries! 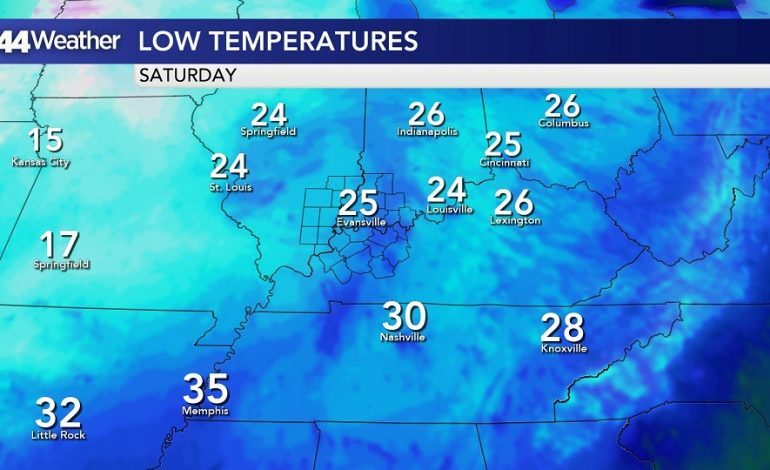 Thankfully, nothing is expected to stick or even accumulate that evening, but will will temperatures plunge to their lowest points since the morning of March 14th; We’ll awake to a morning low temperature of 25° in Evansville on Saturday morning. In fact, the sub-average temperatures that morning will likely lead to our coolest afternoon in the River City since April 16th!